Are you a fan of heavy metal music? If so, don’t miss House of Doom from Play’n GO. This great video slots game looks like it came straight from an ‘80s thrash metal album cover or an occult movie. Despite the dark theme, this slot has tons of great features, like wild reels, free spins, bonus rounds and more. Do flaming skulls sound like your kind of thing? In this review, we’ll take a look at what House of Doom has to offer you. House of Doom is a 5-reel and 3-row slots game. There are 10 paylines. If you are sick of slots games that are bright and colorful, this is the game for you. 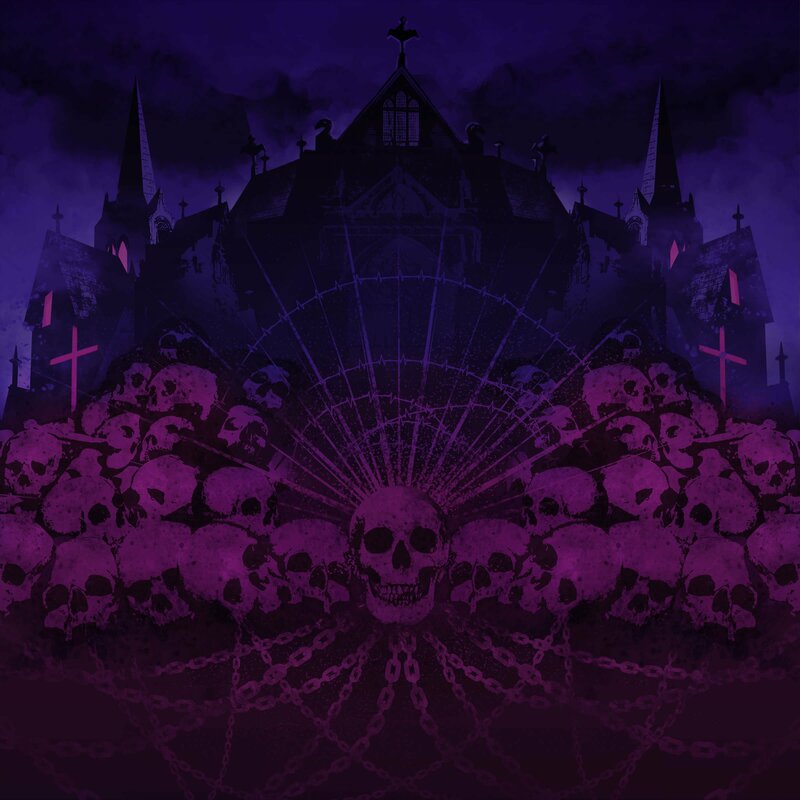 House of Doom, with its dark, occult theme and heavy metal soundtrack, will rock your world. The reels are filled with some classic occult symbols like goat skulls and pentagrams. You can check out the rules and find out what the paylines are by clicking the yellow information button in the bottom left-hand corner of the screen. To get the reels rolling, simply select a coin size and hit the Spin button. In the main game, the special feature you want to watch out for is called Hellgate. Here, one reel is selected and highlighted on every spin. Any wilds that land on the highlighted reel, will expand over the entire reel and replace all other symbols on that reel to give you even more potential wins! House of Doom has 10 regular paying symbols. There are 5 higher paying symbols and 5 lower paying symbols being the traditional 10, J ,Q, K, A. One of the most important symbols is the wild symbol. The symbol depicts a sorceress and it acts as a substitute for any other symbol in the game, except for the scatter skull. Landing 5 wild symbols pays a hefty 100X your bet amount. The other crucial symbol to look out for is the House of Doom symbol. Obtaining 3 of these symbols will instantly grant you 10 free spins! House of Doom has a thrilling bonus feature call Skulls of Abyss. If you want to trigger House of Doom’s exciting bonus round, you first need to get 3 or more scatters, which are the flaming skulls. If you manage to achieve this, you will be taken to the bonus stage where you’ll be presented with 15 flaming skulls. One by one, you need to select skulls to reveal the hidden prize; this might be a cash prize or the Doom Spins feature. In some cases, you might uncover a 1x, 2x, or 3x symbol. If you get one of these, you get to pick again. The Skulls of Abyss bonus feature ends if you reveal a 5x, 20x, or a House of Doom symbol. Online slots players love slots with free spins, and House of Doom is no exception. When you obtain 3 House of Doom symbols in a single spin, you will trigger the Doom Spins and be granted 10 free spins, which you can use immediately. During the Doom Spins, between 2 and 5 reels will be highlighted, which means any wild landing in the highlighted reels will expand over the entire reel for some awesome payouts. You also have the chance to activate Doom Spins when you play the Skulls of Abyss bonus game, where it’s possible to pick a skull that has Doom Spins as a reward. House of Doom does not have a fixed jackpot or a progressive jackpot. If you want to win big, you will need to hit the bonus features or free spins. With the potential to win up to 2,500x your bet in a single round, that’s a rather decent incentive to play House of Doom video slot. This slots game has 10 fixed betting lines. You do not have an option to adjust the number of active lines and your total bet is applied across all paylines. To see an example of the possible winning line combinations, click on the yellow information button on the bottom left corner of the screen. House of Doom has a theoretical return to player of 96.11%. It’s called House of Doom for a reason! This is a highly volatile slots game that can be very unforgiving during the base game. You will need to pace yourself and bankroll to get to the bonus features for the bigger wins. Overall, House of Doom is a quality slots game with some good features. The user interface is simple and effective, and overall the aesthetic and style are well matched to the theme. The sounds and music add to the style of the game, but you will probably mute the sound after a few minutes as the repetitive heavy metal guitar can be a little much. 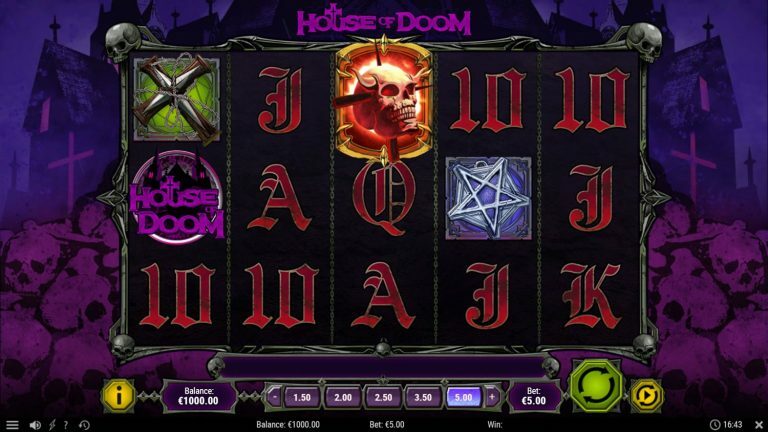 House of Doom is certainly not all “doom and gloom” and while there is the potential for some great entertainment, this slot has a dark theme that might not be to taste of many people. The best way to find out if House of Doom slot is for you, is to give it a try right now at Highroller!